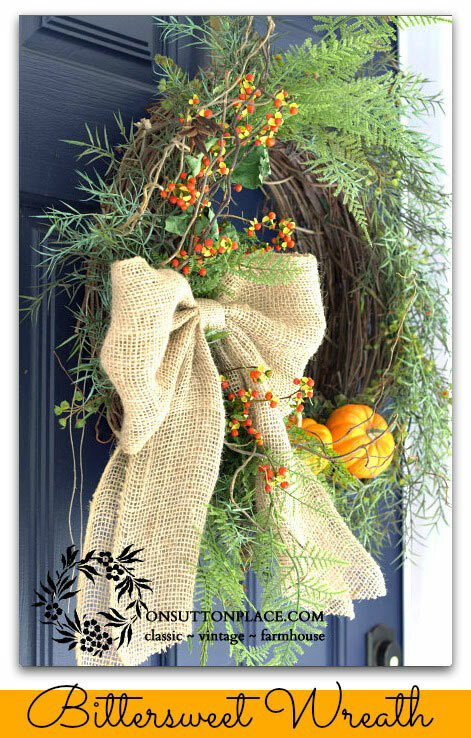 Ann, the author of On Sutton Place, has a knack for creating delightful wreaths for every season. I love studying her decorating projects as they not only speak to me (like her style very much) but I am also amazed at her photography and tutorial skills. One of these days it would be wonderful to meet Ann Drake in person. She lives in Findlay, Ohio, a town not far from our hometown. So already we have a lot in common. Ann's fresh and creative style really caught our eye a couple of years ago already. I especially love her wreaths. For autumn this year, she created a bittersweet and burlap wreath for her front door. It's fresh and beautiful looking with just the right pop of autumn from the cute pumpkins she included to the bittersweet and burlap. How did you decide upon the name of your blog, On Sutton Place? Ann: I started my blog very shortly after I discovered the world of shelter blogs and named it after the street where we live. What is the main theme of your blog? What message do you want to share with your readers? 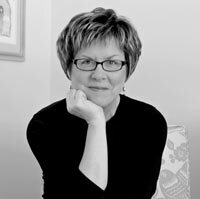 Ann: My blog chronicles my life and my love of home decor, gardening, cooking and anything vintage. My decorating philosophy is simple. Collect what you love and make it work in your decor. After I finally figured that out, and stopped worrying about what was "in," I was so much happier. I hope to help my readers achieve that same happiness. 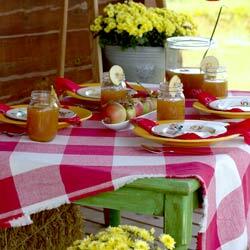 Tell us about your porch and how you and your family spend time on the porch? Ann: My front porch is small but there's just enough room for two chairs and a little table. I sit out there in the afternoon when the weather is nice. My little dog loves to be outside so she's always there with me. It's the perfect place to read the mail or a magazine. Any advice for decorating a porch for homeowners not so savvy about decorating? Ann: My best advice is to treat your porch like you would a room in your house. Use rugs, furniture, lamps, pillows and anything thing else that will cozy up the space. Don't be afraid to bring the indoors out. I am intrigued by how she makes her wreaths. She usually begins with a base of two grapevine wreaths. Two for extra dimension on her front door. Then she has a way of tying a most beautiful bow and shares her techniques on her blog. This wreath is something I'd be proud to show on my front door. I am glad that Ann shares her creativity so generously. 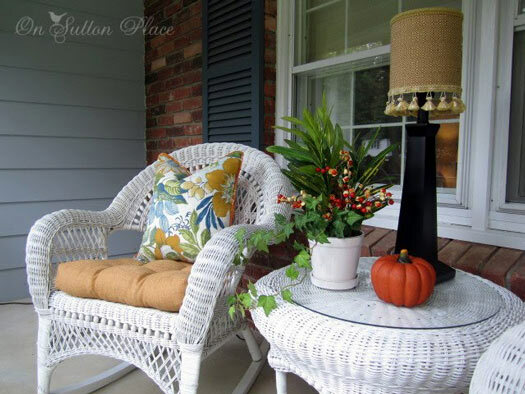 We featured Ann's autumn porch from a previous year. I like her style - it's both classic and vintage rolled into one. Click on the picture below to see all the details. 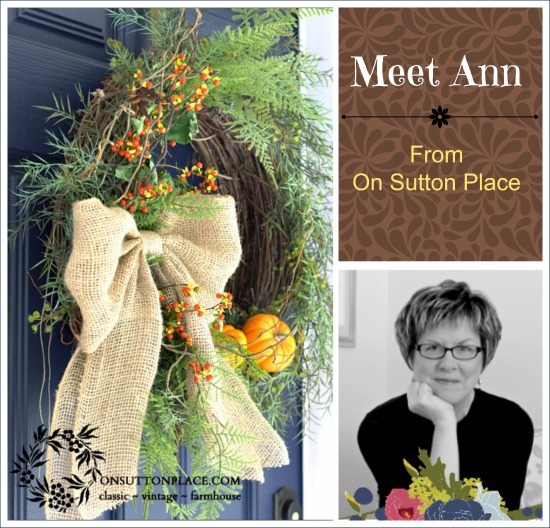 So happy we could share Ann's thoughts with you about life on the porch - and to learn more about her wonderful blog, On Sutton Place. 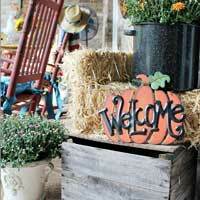 Ann is fabulous at writing tutorials and giving you beautiful ideas for enhancing your home. Please visit Ann's blog to get more details about her bittersweet burlap wreath and many more refreshing ideas at On Sutton Place.